The Intergovernmental Committee for the Safeguarding of the Intangible Cultural Heritage, meeting in Mauritius until 1 December, inscribed thirty-one elements on the Representative List of the Intangible Cultural Heritage of Humanity. Austria; Czechia; Germany; Hungary; Slovakia—Blaudruck/Modrotisk/Kékfestés/Modrotlač, resist block printing and indigo dyeing in Europe–Blaudruck/Modrotisk/Kékfestés/Modrotlač, which translates as blueprint or blue-dyeing, refers to the practice of printing a dye-resistant paste onto a cloth before it is dyed indigo. The paste prevents the dye from penetrating the design. To apply the designs onto the cloth, practitioners use hand-crafted blocks up to 300 years old, featuring regionally-inspired patterns, generic designs or Christian motifs. Nowadays, the practice mainly survives in family-owned workshops, run by second to seventh generation printers, and traditional knowledge is recorded in 19th century journals, most of which are family-owned. Azerbaijan, Kazakhstan, Turkey—Heritage of Dede Qorqud/Korkyt Ata/Dede Korkut, epic culture, folk tales and music—The epic culture, folk tales and music of Dede Qorqud/Korkyt Ata/Dede Korkut (Grandfather Qorud) are based on 12 heroic legends, stories and tales and 13 traditional musical compositions transmitted orally through performances with specific cultural codes and musical compositions. The legendary character of Dede Qorqud appears in each story as an old man whose words, music and expressions of wisdom relate to traditions associated with birth, marriage and death. The practice contains profound knowledge about the history and culture of Turkic-speaking communities and is practised and sustained on a wide variety of occasions. Belarus—Celebration in honor of the Budslaŭ icon of Our Lady (Budslaŭ fest)—The Budslaŭ Fest takes place in Budslaŭ village, in the Minsk region. Every early July since the 17th century, tens of thousands of pilgrims from all over Belarus and other countries come to Budslaŭ to participate in the celebrations of the Budslaŭ Icon of Our Lady, who is said to have appeared to believers in Budslaŭ in July 1588. Taking pride in the relic, locals offer pilgrims a warm welcome and invite them to share meals with them in their homes. Bosnia and Herzegovina—Picking of iva grass on Ozren mountain—Every year, on 11 September, the day of the beheading of St. John the Baptist, inhabitants of villages around Ozren Mountain go up to Gostilj to pick Iva grass before assembling in smaller groups to play, dance and sing traditional music. In the afternoon, Orthodox priests consecrate the Iva. Iva is used to cure and prevent disease and the practice helps preserve traditional costumes, songs and dances. Several local associations invite similar organizations from other regions to partake in the tradition. China—Lum medicinal bathing of Sowa Rigpa, knowledge and practices concerning life, health and illness prevention and treatment among the Tibetan people in China—Lum Medicinal Bathing of Sowa Rigpa is a practice developed by the Tibetan people as part of a life view based on the five elements and a view of health and illness centred on three dynamics (Lung, Tripa and Pekan). In Tibetan, ‘Lum’ indicates the traditional knowledge and practice of bathing in natural hot springs, herbal waters or steams to adjust the balance of body and mind, ensure health and treat illness. The element plays a key role in improving health conditions and promoting respect for nature. Croatia—Međimurska popevka, a folksong from Međimurje—Međimurska popevka, a folksong from the Međimurje region, was historically predominantly sung by female soloists. Nowadays, it is performed by individuals and groups, men and women, in vocal, vocal-instrumental, instrumental, monophonic and multipart renditions, as a musical genre incorporated into the dance. The element is practised in a broad range of social contexts, from solitary music-making to family and community happenings, and most inhabitants will have experienced popevka on numerous occasions throughout their lives. 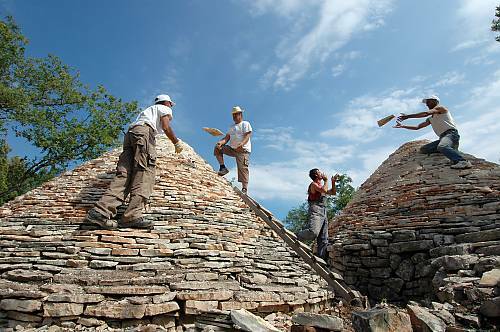 Croatia, Cyprus, France, Greece, Italy, Slovenia, Spain, Switzerland—Art of dry stone walling, knowledge and techniques—The art of dry stone walling concerns the art of building by stacking stones upon one another, without using any other materials except, in some case, dry soil. This know-how is preserved in rural communities where the practice is deeply rooted, and among construction industry professionals. Dry-stone structures have shaped numerous and diverse landscapes with a variety of constructions used as dwellings, for farming and animal husbandry. Such structures testify to the methods used by people from prehistory to the present in organizing their living and working space by optimizing local natural and human resources. Cuba—Festivity of Las Parrandas in the centre of Cuba—Held for the first time in 1820 in the town of Remedios, the Festivity of Las Parrandas is a cultural competition now celebrated by 18 communities in the centre of Cuba. During the competition, each town is divided into two competing parties or neighbourhoods, with ‘spies’ attempting to spoil the opposing neighbourhood’s surprise on the night of the festivity. The festivities combine tradition and modernity and involve a wide range of expressions, including crafts, designs, costumes, music, pyrotechnics and woodwork. Democratic People’s Republic of Korea: Ssirum (wrestling) is a physical game practised popularly in all regions of the Democratic People’s Republic of Korea, where two opponents try to push each other to the ground using a satpa (a fabric strap connecting the waist and leg), their torso, hands and legs. Ssirum is distinguished by the use of the satpa and the awarding of a bull to the winner. Since ancient times, Koreans have practised Ssirum for physical training purposes during breaks from work and, especially, during big contests on folk holidays. On folk days, when Ssirum takes place, lots of people (old and young) gather around the ring: wrestlers compete using diverse techniques; spectators enthusiastically cheer on their favorites; and the winner rides a bull in celebration. As an exercise of the whole body, Ssirum fosters the cultivation of the body and mind. It also encourages mutual respect and cooperation, contributing to the harmony and cohesion of communities and groups. Pyongyang, the capital city, plays a central role in enacting, protecting and transmitting Ssirum, comprising a number of communities, organizations and institutions concerned with the practice, including the Korean Ssirum Association. Koreans start learning Ssirum from family members and neighbours from childhood, and it is taught by educational institutions at all levels. Republic of Korea: Ssireum, or traditional wrestling, is a popular form of entertainment widely enjoyed across the Republic of Korea. Ssireum is a type of wrestling in which two players wearing long fabric belts around their waists and one thigh grip their opponents’ belt and deploy various techniques to send them to the ground. The winner of the final game for adults is awarded an ox, symbolizing agricultural abundance, and the title of ‘Jangsa’. When the games are over, the Jangsa parades around the neighbourhood riding the ox in celebration. Ssireum games take place on sand in any available space in a neighbourhood, and are open to community members of all ages, from children to seniors. They are played on various occasions, including traditional holidays, market days and festivals. 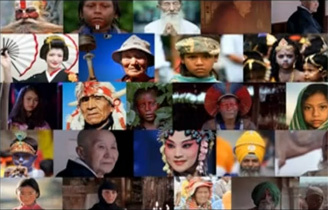 Different regions have developed variants of ssireum based on their specific backgrounds, but they all share the common social function of ssireum – enhancing community solidarity and collaboration. As an approachable sport involving little risk of injury, ssireum also offers a means of improving mental and physical health. Koreans are broadly exposed to ssireum traditions within their families and local communities: children learn the wrestling skills from family members; local communities hold annual open wrestling tournaments; and instruction on the element is also provided in schools.